Is it already Friday again? ... This week is surely going very fast. We had a hot weather during this week and I think it will continue as we have already entered the dry season. But I'm still hoping it will be raining this weekend. Oh, this monkey is soo happy for Friday! And with his little banana, no wonder! I love the mango flowers; we have a box of mangoes and I keep forgetting to use in bento, because we can each eat a whole mango by ourselves, hehe! Love this round bento, it's so adorable! I guess it is Monkey Bento Day,eh? @prince n princess mum : Thanks a lot for your nice words! Looking at the monkey makes me feel happy... ohh TGIF!! Lia, just wondering will the mango turns brownish and the cheese melts when Andrew about to eat it? Cheese melts becuase I believe fish cake will have some water. oh dear, this will be the most adorable monkey i have ever seen..:D.. It going to be a happy friday to see your bento early in the morning.. haha..
@Vanessa : Thanks a lot Vanessa! Mango is like apple or pear, easy to turn brownish after few hours. And put cheese inside the bento for tropical country like us especially during dry season is not an easy job. I try to minimize the mango turns brownish by picking the right mango and spray them with lemon water. Don't choose the mango that too ripe. For the cheese, I do that on the last step. Is so important that we don't put cheese on the top of the hot / warm rice. Fish cake has been dried up before I put the cheese on the top. And what I do when I'm packing with cheese included is that I always cover the top of the lunch box with plastic wrap so is airtight and put the lid after that. At least this help to maintain the cheese to become dry or melted for few hours. Plus the class is with AC, does that help a little bit? hehehe ... The kids never complained, so I think it's still okay until lunch time :D Although I know the cheese will not look like exactly the same as I took the picture. @Rachel Hei : Thanks a lot Rachel! So sweet ... Have a nice weekend too :) Hope you have a bunch of fun! so many cute touches in here - the monkey is cut perfectly and the banana is adorable, i love the edamame skewers with the leaf picks, and the mango flowers and kamaboko are such bright accents. lovely set-up as usual too, with the background and cute hashi! hahaa...seems like the little monkey is welcoming the weekend in opened hands. So adorable. @megan : Thanks a lot Megan for your sweet comment! We are excited to move but so many things to pack :) Hope you have a great weekend too and get the new apartment soon! Kawaii! And the mango looks really beautiful like this, yum! Have a good weekend, too! Awww, the monkey would make anyone smile back. The mango almost looks unedible. They're so perfectly cut! What a nice happy monkey to celebrate Friday!! We're having lots of rain here today, yuck! 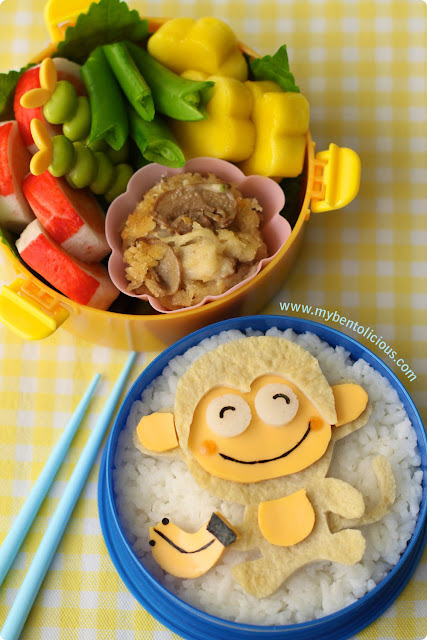 A monkey themed bento is so much fun! Have a fab weekend Lia! Such a cute monkey!!! Love all the colors... so bright and cheery! @Angeleyes : Thanks a lot Alice! Lia, this is late. But the monkey is so so cute! And the bananas too! Love it.